Well, it came to pass that there was a hireling in the town of Opportunity with good stats and a peculiar set of general proficiencies, including Seafaring, Language Skanuck (the Norse equivalent in this setting), Navigation, and a high strength. It was decided that this hireling was a Norse woman come south, and she hired on with Tormond to train in the ways of crazy warrior women. But, we were not satisfied with Fighter, Paladin, or Barbarian for this. No, we decided we needed a very specific, Nethack-inspired class - the Valkyrie. It comes as little surprise to outlanders that Skanuck society is male-dominated, as the activities the Skanucks are best known for (namely raiding, pillaging, looting, raiding, and pillaging) are traditionally male enterprises. Many outlanders are thus quite surprised (often terminally) upon their first meeting with the valkyries, Skanuck warrior-women who been found worthy of assistance by their ancestors, much to the chagrin of the various patriarchal cults pervading Skanuck culture. 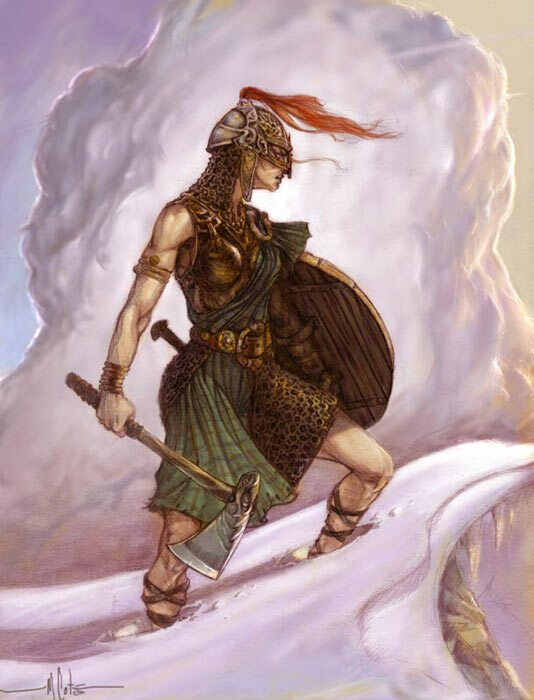 Legend has it that the first valkyrie was the only child of a Skanuck warrior who, while dying in the snow, willed to her his strength. These days it is considered scandalous and shameful, but not unheard of, for a daughter to take her father's place on the long-boats if he gives her his blessing from the grave. Valkyries are skilled fighters, though they train with only a small selection of traditional weapons. At first level they hit AC 0 on a roll of 10+, and they advance in attack and saving throws at the same rate as fighters, by two points per three levels of experience. Valkyries increase their base damage roll from successful melee attacks by +1 at 1st level, and an additional +1 at 3rd, 6th, 9th, and 12th levels. Valkyries are proficient with only a small selection of 'honorable' weapons, limiting themselves to spears, broadswords, battle axes, hand axes, short swords, and daggers. They may fight with a weapon and a shield, or with a single weapon in two hands. As the Skanucks are not adept smiths, and have not yet mastered the production of scale and plate, valkyries are limited to chainmail and lighter armors. However, valkyries are widely known as "shield maidens", and not without reason; they are adept shield users, gaining Fighting Style (Shield) at 1st level. All valkyries, being trueborn daughters of Skandia, speak fluent Skanuck. Hence, they gain Language (Skanuck / Norse) for free at 1st level. Valkyries are hardened by long years of experience in the harsh tundra, and in savage tribal warfare. As a result, they are hard to surprise (+1 to surprise, +1 to initiative when not spellcasting), inured to freezing cold (immune to normal atmospheric cold, +2 to saves against magical cold, and -1 damage per die from cold), and resilient (roll twice on the Mortal Wounds table, choosing which result to apply). Valkyries also benefit from the protection of the ancestor spirits when fighting for righteous causes, gaining +1 to saves and AC against evil creatures. They appear outlined in radiant luminescence when viewed with detect good, detect magic, or true seeing. Starting at 3rd level, their forefathers provide further blessings, granting limited divine spellcasting to the valkyrie. The number of divine spells available per day to the valkyrie are shown on the table below; they take effect as if cast by a cleric of half her level, rounded up, and are cast from a short list following. In order to remain in good standing with her ancestors, the valkyrie must strive to perform acts of valor and strength at arms in an honorable fashion. When a valkyrie reaches 5th level (Spear-Maiden), her fearless demeanor inspires those who follow her. All henchmen and mercenaries hired by the valkyrie gain a +1 bonus to their morale score whenever she personally leads them. This bonus stacks with any modifiers from the valkyrie's Charisma or proficiencies. At 9th level (Valkyrie), a valkyrie can build or claim an aerie, traditionally on a mountain peak, from which she might rule a domain. When she establishes her aerie, 1d4+1x10 0th level mercenaries and 1d6 valkyries of 1st-3rd level seeking training will arrive seeking jobs and training. If hired, they must be paid standard rates for mercenaries. Valkyries' aeries are otherwise identical to fighters' castles, as detailed in the Campaign chapter of the ACKS rulebook. Sea Valkyrie Template: This pre-generated template represents a valkyrie member of a Skanuck raiding vessel. As an aside (for this post is entirely too long already), I kind of wonder if this gradual, iterated "Man, you know what this settings needs? Viking ladies with axes"-type design process is how the Wilderlands of High Fantasy ended up with Amazons and green men and cat people and dragon-headed ogres and all kinds of other crazy stuff. That's a nice class design. I shall give you an imaginary gold star to attach to your shirt. This template is ready for adventure. I like that a lot though; espc. the Flame/Lightning Strike, and I'm totally yoinking the 'inured to freezing cold', as I don't recall seeing that in the ACKS-PC. Ah, you're right! I feel like I shouldn't edit it in, though. Inured to Cold was not indeed in the ACKSPC, but the way I figured it, if Protection from Evil (as the Paladin ability) is a 1st-level, long-duration conditional divine defensive spell, and that was OK for Paladins to have constant effect, Resist Cold probably was too. So that's how that one came about. And yeah, elemental substitution is an easy way to add a little different flavor. I'll have to post Summon Legendary Ancestors at some point, though. This is a great class. I have a longstanding "no gender-based limitations" rule, but I might reconsider in this case. Thanks! ACKS has a lot of female-only classes - bladedancer, priestess, and witch all spring to mind. We don't really enforce it, though, since the rules hardly ever actually depend on it; we've theorized male dervishes and male priests, and nobody's really given the witch much thought yet. So yeah, I was kind of just rolling with the way ACKS handles things. Feel free to circumvent it or keep it, as you prefer! Yesss... my nethack obsession pays off. Very cool class. I like it. John, we play the heck out of some ACKS over in Louisville, Ky. (www.louisvillednd.com) and I was planning to come up with a Valkyrie class very similar. It makes far more sense for me to steal your nice design. Mind if I borrow this and put it in our campaign class booklet (with proper attribution of course)? Certainly! Glad it fills a need! I love this class so much. If/when I run a Nordic campaign, it's going into the game. I love this class. Consider it used, though with a few tweaks. Such as replacing Sanctuary with Angelic Choir, because valkyries need riding music.